If you have an equine foot due to your neurological injury, here are some tips so you can prevent capsular retractions, joint stiffness and muscle shortening. 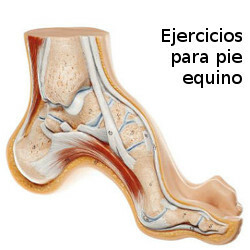 In the case that you already have them, it will be a matter of spending more time, but following these recommendations you could improve the contact of your foot with the ground and get better mobility for your foot. As you should know, due to your joint misalignment, when you support the foot while standing or walking, there is a large part of the weight of the body that falls on the tip and the lateral part of the foot. Therefore what you should work is the support of the heel and the internal part of it. You must do the exercises barefoot to allow the foot contact with a flat surface and control the supports well. First exercise: place the flat foot on the floor and bend the knees keeping the heel in contact with the ground. Direct the knees inward if you notice that you lack support on the inside of the foot. Second exercise: get yourself a wedge with a slight inclination and stand on top. A good idea is to place it in a place in your house where you spend a few minutes a day, in the basin sink, for example. In this way you will ensure you perform the exercise daily. If you have difficulties to perform these exercises do not hesitate to contact the physiotherapists of the Nerorehabilitación Clinic to make an assessment and we can help you in the realization of them.